This morning in Lawrence, Mass., the local high school Girl’s Ensemble was scheduled to sing “The Internationale” at City Hall. Before that, the morning’s schedule at the Lawrence City Hall included reading of a mayoral proclamation, ringing of the City Hall bell, and raising of the flag. It’s not every day your city high school sings “The Internationale.” But this is not an ordinary day. 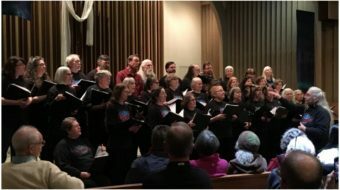 It is the 100th anniversary of the 1912 Lawrence textile strike that inspired the poem and song “Bread and Roses.” The events listed above and more were organized by the Massachusetts-based Bread and Roses Centennial Committee. A hundred years ago Lawrence was a center of the textile industry, employing large numbers of women, and even children, and many immigrants, in unhealthy speed-up conditions at miserable pay. After the state legislature cut the workweek from 56 to 54 hours, mill owners in Lawrence, rather than adjusting hourly pay rates to maintain workers’ take-home pay, simply cut their pay, and refused to meet with worker committees about it. On Jan. 12, 1912, 10,000 workers launched an eight-week strike whose message resonates down through the decades: we fight not just for bread (wages) but for roses (dignity, quality of life) too. The stormy eight-week battle, led by the IWW (Industrial Workers of the World) gained national attention. 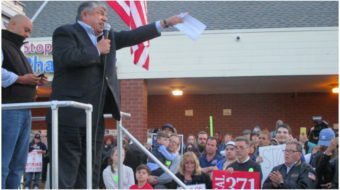 It included mass protests involving the entire community and beyond. Elizabeth Gurley Flynn was one of the fiery young IWW organizers there. The legendary Joe Hill later dubbed her his “Rebel Girl” because of her role. Gurley Flynn went on to become a national leader of the Communist Party USA. As we commemorate the “Bread and Roses” struggle today, there are some who want to take us back to the bad old days. Republican presidential contender Newt Gingrich, for example, recently called child labor laws “tragic” and “stupid.” Condemning “core policies of protecting unionization,” he called for firing unionized school janitors and making low-income students do their jobs. Child labor anyone? In fact, all the Republican candidates, like their colleagues in statehouses across the country, would like to curb and ultimately get rid of unions. In other efforts to take us back to an ugly past, right-wingers are attacking the dignity and rights of women and immigrants. As in 1912, so today in 2012, the fight is for bread and roses – economic security, a better life, and human dignity. 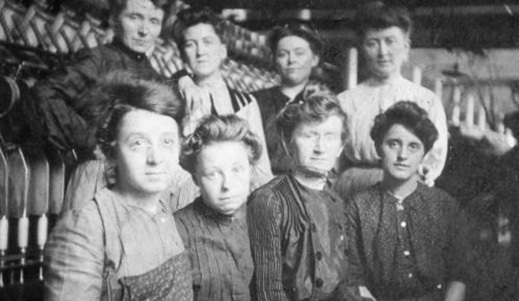 Photo: Women mill workers at the time of the “Bread and Roses” strike. Bread and Roses Centennial Committee.